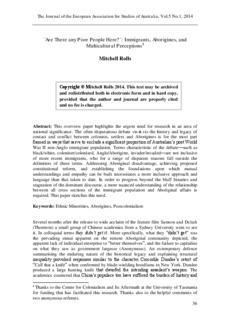 Copyright 2014 Mitchell Rolls-This text may be archived and redistributed both in electronic form and in hard copy, provided that the author and journal are properly cited and no fee is charged. This overview paper highlights the urgent need for research in an area of national significance. The often disputatious debate vis-à-vis the history and legacy of contact and conflict between colonists, settlers and Aborigines is for the most part framed in ways that serve to exclude a significant proportion of Australian’s post World War II non-Anglo immigrant population. Terms characteristic of the debate—such as black/white, coloniser/colonised, Anglo/Aborigine, invader/invaded—are not inclusive of more recent immigrants, who for a range of disparate reasons fall outside the delimiters of these terms. Addressing Aboriginal disadvantage, achieving proposed constitutional reform, and establishing the foundations upon which mutual understandings and empathy can be built necessitates a more inclusive approach and language than that taken to date. In order to progress beyond the bluff binaries and stagnation of the dominant discourse, a more nuanced understanding of the relationship between all cross sections of the immigrant population and Aboriginal affairs is required. This paper sketches this need.